In our 2019 catalog, we are thrilled to introduce a multitude of exciting new products that stay true to our heritage, providing form and function that’s both easy on our wallets and our planet. IKEA announced today the release of the 2019 IKEA U.S. catalog as the iconic Swedish home furnishings retailer marks its 75th anniversary. Filled with new product offerings, home furnishing inspiration, and smart solutions for every area of the home, the 2019 IKEA catalog will be available to the public starting this August. Celebrating how differently we all live and 75 years of enabling a better everyday life at home for the many, this year’s catalog features seven distinct homes representing a wide range of styles, sizes and budgets. From a space-limited apartment serving a large family to a home totally dedicated to eco-friendly choices, the newest IKEA catalog highlights products and solutions that can help everyone achieve a better everyday life at home, no matter how they live. Each of the seven homes featured in the 2019 catalog, which have their own unique backstories and living situations, were derived from insights in the IKEA 2018 Life at Home Report. The annual in-depth research study behind the report includes a series of home visits, interviews and surveys from consumers around the world to better understand both the joys and challenges of life today. The insights gleaned from the report not only inspired the fictional homes in the 2019 catalog, but also the new products featured throughout its pages. To find out more about what’s new at IKEA, view the digital version of the catalog and request a printed copy (also available at local stores), U.S. consumers can visit IKEA-USA.com/catalog. This year, to pay homage to 75 years of inspiring a better everyday life at home, IKEA fans in the New York and Chicago area will be able to encounter IKEA in a whole new way with the limited-time IKEA Inspiration Experience. 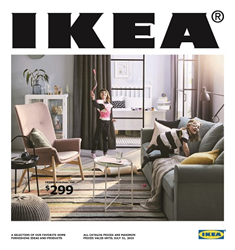 This free, interactive pop up event is designed to both surprise and delight IKEA fans by simultaneously allowing them to “step into” room settings from the 2019 catalog, test their trivia knowledge while learning more about IKEA and even walk away with IKEA prizes. Chicago: At the end of August, consumers can visit the IKEA Inspiration Experience located at 679 North Michigan Avenue (corner of Michigan Avenue and E. Huron St.). Exact dates and times to be announced soon. For more information about the IKEA Inspiration Experience, follow IKEA on social media @IKEAUSA. NOTE FOR PRESS: Please visit our press site at IKEA-USA.com/2019catalog for downloadable information and assets, including the press kit, digital catalog, images, videos and more. For additional information, product loans or images, please contact the IKEA U.S. Press Office at press.us@ikea.com or contact Kathy.Boerner@Ketchum.com. Since its 1943 founding in Sweden, IKEA has offered home furnishings of good design and function at low prices. The IKEA Group operates 363 IKEA stores in 29 countries, including 48 in the U.S. IKEA incorporates sustainability into day-to-day business and supports initiatives that benefit children and the environment. For more information see IKEA-USA.com, @IKEAUSANews, @IKEAUSA or IKEAUSA on Facebook, YouTube, Instagram and Pinterest.